We are excited to introduce you to Jonathan Gonzalez! An outstanding Cyber Security & Information Systems student that exudes leadership in everything he does! As Vice President of Delta Sigma Pi, Jonathan collaborated with the Career Center last fall to plan an Externship experience for 1st year Business Students. 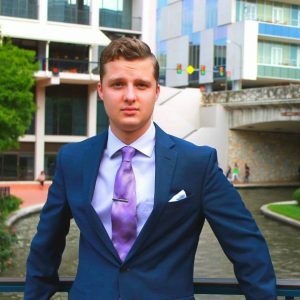 During the January event, Jonathan led the group in a nail biting “Shark Tank” activity where students created a new business idea and pitched it to the Delta Sigma Pi “Sharks.” His charismatic leadership and authenticity radiated the room and Jonathan was quickly recruited to be an Intern Mentor for Spring 2018 Internship Week. As an Intern Mentor, Jonathan led a small round table discussion during the Career Center’s Student Networking Mixer. He shared his story as a Management Information Systems Intern with Digital Defense Inc. and provided students with tips on how to be successful. Jonathan never misses an opportunity to help other students succeed and is the true definition of a leader. We are honored to highlight Jonathan this Month and share his story with you! Join us in exploring his highlights, challenges, and advice for future interns in our Q/A interview. How did you obtain your internship(s)? A brother from my fraternity contacted me regarding an open position at Digital Defense. I stayed up to date with the company’s job postings until I saw the right fit and applied. What did you do during your internship(s) and what were your responsibilities/duties? I reduced company risk through mitigation of computer vulnerabilities, created Reconnaissance Network Appliances for client distribution, and performed daily maintenance of proxy, distribution, and application databases. What was the exciting aspect of your internship(s)? Observing the various IT roles that function within a company and getting a firsthand look into the different paths within cyber security. It was exciting to get a glimpse of where my future career can take me. What was the most challenging aspect of your internship(s)? Making myself stand out every day among the other interns. What recommendations do you have for other students about doing an internship? Ask your managers about your progress and ask for advice and critique, as it shows you are taking an initiative towards your career. What did you enjoy the most about these experiences? Being able to see the day to day operations of a prominent cyber security firm on a firsthand account. How has your internship(s) prepared you for a career? My internship has shown me the different paths available to me within the field of cyber security. I would like to be an IT Project Manager with a leading fortune 500 financial company.